Blu-ray Player – это лучший, всемирно известный Blu-ray-плеер, который легко и на высокой скорости проигрывает все медиа форматы. С помощью уникальной технологической инновации AirX, Blu-ray Player может легко проигрывать любое Blu-ray видео на iPhone / iPad / iPod touch. Выдающаяся возможность расшифровки и простой интуитивно понятный интерфейс позволят вам получить настоящее удовольствие от простотра видео в качестве Blu-ray HD. Плеер может проигрывать не только Blu-ray HD фильмы, но поддерживает любой пользовательский формат видео, аудио. 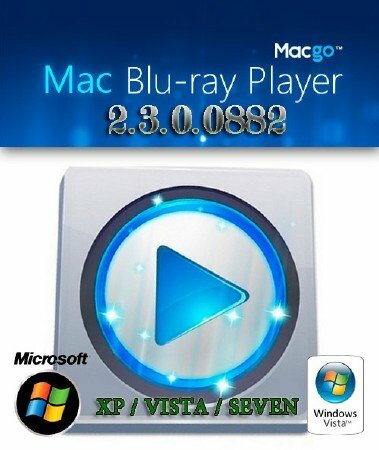 Mac Blu-ray Player имеет поддержку Blu-ray фильмов, DVD, VideoCD, MOV, MKV, AVI, FLV, WMV, MP4, MPEG, RMVB, MP3, WMA, AAC, AC3 и других медиа-форматов. Mac Blu-ray player, the world’s first blu-ray player for Mac, is the unique video conversion tool that supports both Mac and Windows systems. It is its birth that finishes the history that Mac cannot play Blu-ray disc. It is powerful and distinguished. Mac Blu-ray player is able to support all mac models, including not only macbook pro, air, mac mini, but also imac and mac pro. Therefore, with this blessing tool, current Mac users are available to enjoy their favorite bluray movies in fun on their beloved Mac devices. With advanced Blu-ray decryption and processing capability, Mac Blu-ray Player can decrypt any Blu-ray discs successfully as well as DVD. The Mac Blu-ray Player is possible to read commercial Blu-ray discs released in different regions, as well as removing BD+ and AACS encryptions from latest Blu-ray movies. It allows users loading commercial blu-ray discs directly from Blu-ray Disc and Blu-ray Folder. Also, Mac Blu-ray Player is able to play DVD discs. It supports DVD decryption and DVD menu. Outstanding universal performance and all media formats supported. Mac Blu-ray player is a universal media player that can play not only movies, videos, audios but also music and photos. What's more, Mac Blu-ray Player can support all media formats existing today, including Blu-ray, DVD, VideoCD, MOV, MKV, AVI, FLV, WMV, MP4, MPEG, RMVB, MP3, WMA, AAC, AC3 and more. Although there are complex codecs and hardware acceleration techniques working in the background, we tried to keep the front end simple enough for users with any level of computer knowledge.